The unexpected election result leaves the Conservatives seeking to establish a minority government, with support from the Democratic Unionist Party’s ten MPs. With fewer than half the seats in the House of Commons, and barely more than half when adding the DUP, Theresa May’s new government will face many additional challenges in parliament. Meg Russell explores some of the clearest examples. Following weeks of speculation about the general election result, few were contemplating the prospect of a minority government led by Theresa May. The Prime Minister proposed the election in the clear expectation of an increased House of Commons majority, citing (in a rather exaggerated manner) difficulties in parliament. Instead she now doesn’t have a majority at all. With one seat still to declare, the Conservatives are on 318 in a 650-number House. Combined others (excluding seven Sinn Féin, who do not take their seats), have 324. May’s government is hence liable to be outnumbered without relying on the support of the 10 DUP members, with whom she has opened talks. The Prime Minister’s initial statement gave little detail of the form that the relationship with the DUP is likely to take, but it is assumed that she will seek a single-party minority government rather than a formal coalition. The Constitution Unit’s December 2009 report Making Minority Government Work suddenly looks like essential reading, for politicians and politics-watchers alike. As it sets out, there are various options in a situation where a government lacks a single-party majority. One is a formal ‘confidence and supply’ arrangement, whereby another party (or parties) pledge to support the governing party (or parties) in confidence votes and on essential funding decisions; another is for the government to simply negotiate support for policies on a case-by-case basis. A coalition is the most formalised arrangement, with both parties signed up to a programme and liable to both have ministers in the government. Our report emphasised (as repeated more recently on this blog by one of its authors) that minority governments are not unusual in other democracies, and can be relatively stable. Nonetheless, particularly in the UK context where majority governments are the norm, such an arrangement will present a number of fresh (or enhanced) challenges for the government in managing its relationship with parliament. These may affect all kinds of areas of policy; but the Prime Minister will be perhaps most troubled about their impact on the Brexit process. In the Westminster system, the government has considerable discretion in setting the House of Commons agenda. The infamous Standing Order 14 sets out that ‘Save as provided in this order, government business shall have precedence at every sitting’, going on to list specific exceptions (as further discussed below). This means that for much of the time the government can determine the topic for debates, and how much time is given to (which) government bills. It can, to an extent, keep unwelcome topics off the agenda. Notably, SO14 does not specify that to benefit from this privilege the government must have a Commons majority. Unlike in some legislatures, including the Scottish Parliament, there is no requirement for the agenda to be approved by parliament itself – instead it is simply announced in the weekly ‘Business Statement’ by the Leader of the House of Commons. Nonetheless, to maintain smooth relations with parliament there tends to be some consultation with other parties (particularly the main opposition) through the so-called ‘usual channels’. In this delicate hung parliament situation there will almost certainly need to be some consultation with the DUP, as well as potentially with the opposition. The most important form of parliamentary business on which decisions must be made is legislation. In the chamber of the House of Commons itself, the new government will be very susceptible to potential defeat, given the narrowness of its advantage over other parties – even when the DUP are included. This will affect the second reading, report stage and third reading of government bills. There will be a need for careful scheduling (particularly around DUP absences in Northern Ireland), and whipping will be extremely tight. Even a tiny number of absences on the government side (e.g. due to illness or travel delays) could cost the government its majority in crucial divisions. This could make life quite difficult for Conservative members, including ministers – who frequently have important business outside parliament. Any slipups could result in ‘ambushes’ by the opposition parties acting together. It is possible to imagine many issues on which Labour, SNP, Liberal Democrats, Plaid Cymru and Greens could happily join forces – though such organisation is also quite taxing on the non-government side. Separate problems are likely to manifest themselves in public bill committees in the Commons, which consider the committee stage of bills. Standing Order 86 specifies that the Committee of Selection (which is responsible for nominating members of public bill committees) must ‘have regard to… the composition of the House’, which is in practice interpreted essentially as a requirement for party proportionality. Such committees can have between 16 and 50 members. The closeness of the numbers between government and opposition sides in this new parliament makes it difficult to justify a government majority on such committees, even if they are relatively large. This may become an early bone of contention. In the 1992 parliament (when John Major had a diminishing majority) an agreement was reached that bill committees should have one more government party member than opposition member. But this required approval on the floor of the House. With DUP support, Theresa May might muster such support, but the move could be controversial. Public bill committees with no government majority would make life very difficult for ministers. Controversial policies could be readily defeated in committee, requiring a degree of cross-party consensus to be built. Added to the problems above, all of this points to the government legislating as little as possible. However some legislation, such as the so-called ‘Great Repeal Bill’ to facilitate Brexit, is essential – and this measure is already controversial. Some similar considerations apply to House of Commons select committees, which are likewise required to be broadly proportional. Most select committees have 11 members, and usually have a government majority. But (unlike public bill committees) these committees are not whipped, and they do not take decisions on government bills. Hence their partisan balance is relatively less important, and they often operate consensually. Nonetheless, 11-member committees create difficulties in a more-or-less 50:50 parliament, and there may be a need to reconfigure them with an even number of members. So the government, lacking a majority, may lose control of some things in parliament that it is accustomed to controlling (at least in terms of party balance). Meanwhile, there is much else in the Commons that the government does not control. Exceptions in Standing Order 14 include those for opposition day debates and backbench business, where the topic is chosen by the opposition frontbench or backbenchers (of any party) respectively, and the debate may end with a vote. These come on top of the usual scrutiny mechanisms of parliamentary questions, and questioning during government statements and debates. These opportunities can be used to put matters onto the agenda which are uncomfortable for the government, and in the 2015 parliament opposition days were used particularly effectively to force the government’s hand on Brexit matters. In order to avoid defeat in such debates, due to the threat of government backbenchers voting for the opposition motion, the government committed to facilitating further parliamentary discussion on Brexit, and to publishing its Brexit plans. In the 2017 parliament, with numbers that are even tighter, such pressures – not just on Brexit, but also potentially other policy areas – seem likely to be increased. Even beyond legislation, the government will hence need to maintain extremely close contact with its backbenchers and remain responsive in order to avoid defeat. All of these pressures relate to the House of Commons, but the government’s challenges in the House of Lords are if anything even greater. As recorded on this blog immediately after the previous general election, the 2015 Cameron government was the first Conservative administration in modern times to face a potentially hostile House of Lords. The government has suffered numerous defeats in the Lords, including the major showdown over tax credits. 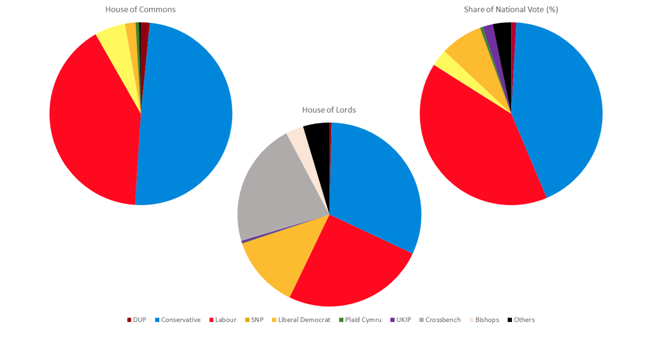 The current make-up of the Lords is shown in the figure below, alongside the equivalent for the Commons and the share of Thursday’s popular vote. This shows how, compared to the popular vote, the Liberal Democrats are underrepresented in the Commons but more strongly represented in the Lords. Here, Labour and Liberal Democrats combined can readily defeat the Conservatives (since the more numerous Crossbenchers tend to vote less, and to split their votes roughly equally between government and opposition). As the Conservatives gained only a minority of the popular vote on Thursday, the opposition may feel justified to join forces in the Lords to defeat any particularly controversial policies that survive the Commons. All in all, therefore, Theresa May’s 2017 government is in a fragile position in parliament. It will need to need to please the DUP (the right) in the Commons, whilst also being mindful of Labour and the Liberal Democrats (the left) in the Lords. In practice it may have to navigate its way through both chambers by focusing where it can on relatively consensual policies, taking particular care to listen to its own backbenchers, and not inflaming opposition parties unnecessarily. This may sit awkwardly with Theresa May’s governing style. Nonetheless, the prospect of an additional general election later in 2017 – which has been canvassed in the media – seems unlikely. Assuming that the Prime Minister can reach an agreement with the DUP, and thereby win support for her Queen’s speech, any early dissolution of the 2017 parliament depends on the terms of the Fixed-term Parliaments Act. This depends either on a vote of no-confidence in the government which, if passed, would likely be followed by an attempt to form a fresh government without an election – something which presently Jeremy Corbyn’s team seems keen to do. The opposition would only trigger an election via this route if it was really convinced that it could win (which, given Theresa May’s recent experience, might well be judged risky even if it was ahead in the polls). The Prime Minister herself, meanwhile, can only trigger an early election if she (as occurred this April) could gain the support of two thirds of the House of Commons, which would require substantial opposition support. The opposition would be unlikely to provide this, in turn, if the Conservatives were significantly ahead in the polls. Both parties would surely be cautious about facing the electorate again, particularly if this meant subjecting them to a second election within a year. So this (very) hung parliament may be with us for some time to come. This entry was posted in Elections and referendums, Government, Parliament and tagged 2017 general election, Conservative Party, DUP, House of Commons, House of Lords, meg russell, public bill committees, select committees, Theresa May. Bookmark the permalink. ← 2017 candidate selection: what might the new Conservative intake look like?